I had a dream that I was on my front porch and across the yard at the bird feeder sat a large owl. It started to spread its wings and fly toward me. I became scared and ran in the house. I thought, what am I scared of?? I went back out to the porch and looked at the owl heading straight for me. I crouched down and put my gloved arm up so the owl could land there. I felt the weight of it landing and with effort I rose, feeling courageous with the owl in the air beside me! For a year after having this dream I looked for the right picture of an owl, as I had never painted one before and was feeling frustrated with my unsuccessful attempts. Eric then surprised me with a magazine with the exact image I had dreamed. It had the actor Roy Dupuis on the cover, standing and holding an owl just like in my dream. I immediately got to painting and, voilá, Courage! 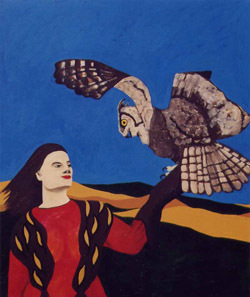 My interpretation of this dream is that the owl, a predatory creature, symbolized my family: I had felt fearful of dealing with them, but with the proper equipment – a long, protective leather glove – I could connect with them. It would take courage and effort to face them as they are, but I did it!